Cut Resistant Kevlar Sleeves - Moar Stuff - You don't need it but you know you want it. $15.95 $24.95	Get Your Stuff! 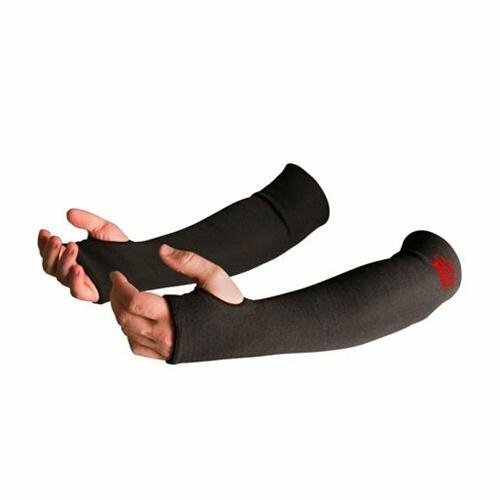 These Cut Resistant Kevlar Sleeves are perfect for people who work with things that can easily cut them up. Jobs like roofers, construction/metalworkers, or just clearing brush from the back yard. These lightweight sleeves slip over your arms and cover part of your palm. There’s a thumb hole to help keep them in place. Since they’re capable of deflecting intentional slashes from even the sharpest knife, an accidental cut should be no problem for them. They’re even flame resistant just in case you need some protection from fire when working. Oh, and of course, they’re great for a tequila-fueled drunken knife-fight in Tijuana during your next over-the-top bachelor party. Wait? You don’t do that? Really, just me? Hmmmm… maybe I do need some help. Anyway, these sleeves are 18 inches (46 cm) long and offer a double layer of tough Kevlar to keep your arms cut-free. They weigh just 0.3 oz (8.5g) and are sold in pairs. For the more tactically minded among you, they are black and would be a great addition to your protective gear. Weight: 0.3 oz (8.5 g).